Have a wonderful & safe Thanksgiving. I will be back on Monday, December 2! Printable Coupon for Kohl’s that saves you 15% Off storewide purchase. Expires 12/01/13. This one is good IN-STORE and ONLINE. EXPRESS Black Friday Sale and Get 50% Off Every Single Item In-Stores & Online ! Sale runs until Noon Friday! It’s a great time to freshen up your wardrobe! Free shipping on all orders over $125. Walgreens is offering a FREE 8×10 Enlargement through 11/30/13. You just need to enter coupon code TURKEY8X10 at checkout to get yours! Choose in-store pickup and you avoid any shipping fees. 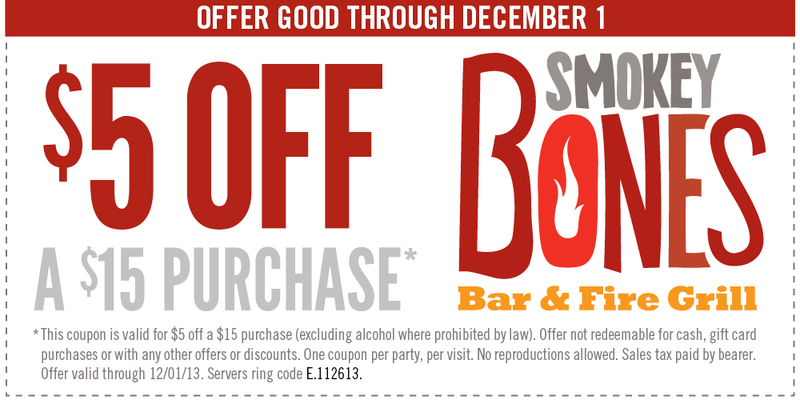 Smokey Bones is offering a $5 off $15 Purchase Printable Coupon! FREE Martha Stewart Living Magazine Subscription - You don’t need a rewards password.